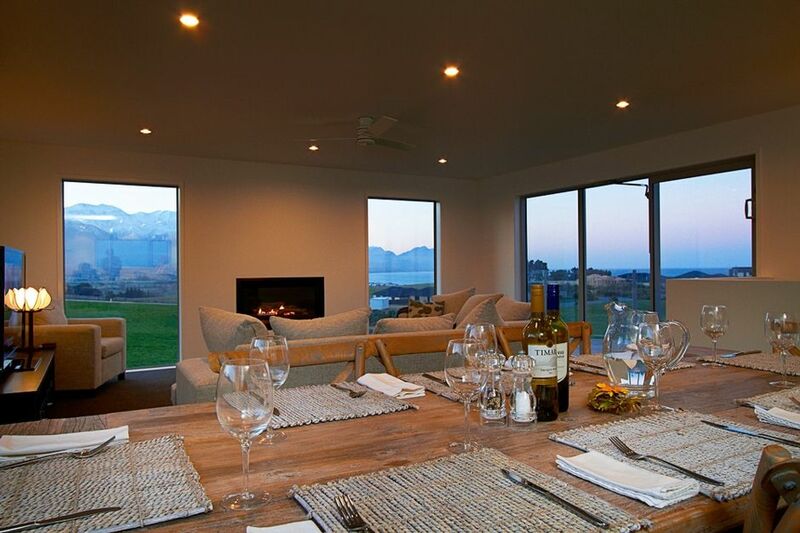 Guests can enjoy the exquisite views of the commanding Kaikoura mountain range and the sun kissed aqua of the sea from the lounge, balcony and even while sitting in bed having a morning cuppa. This modern house has only been recently built and is luxuriously furnished. For the outdoor enthusiast bush and nature walks are on your doorstep. On the water enjoy whale watching, kayacking and swimming with the dolphins or seals. Dine at the many fantastic restaurants or hotels and enjoy fresh local seafood and world famouse Marlborough wines, or cook your very own gourmet delight in the deluxe kitchen and dine in luxury overlooking the great pacific. Linen is included including towels. Fully serviced package available. Walk in walk out. The house and view are beautiful for sure - but NOT worth what they are charging. This house charges luxury prices then provides backpacker like amenities. When we arrived there was no toilet paper, so the cleaners had to return to bring some. The "cleaning" job was obviously a rush job. There was no dishwashing or laundry detergent, no salt and pepper, no rubbish bags, two of the four towels were ripped so badly in the middle they nearly ripped in half, there were 35 dead flies in the window sills. We do not expect "hotel service" at a rental home but basic home amenities must be provided at such a high per night price. Also, we couldn't find the home instruction book so we couldn't figure out the tv or the fireplace until the last day when my husband arrived and miraculously found the book in a downstairs bedroom. There is also no internet. This could be a perfect holiday getaway, but it is managed poorly, cleaned poorly, and obviously the owners are just trying to squeeze out more money before the property is sold. WILL NOT GO BACK! Great views and location, but the kitchen wasn’t that clean and we had to wash up items before we used them. This property is for sale and it showed. It seemed to be lacking in cleanliness, not stocked with necessities (paper towels, shampoo, soap, etc.} The kitchen sink lever fell off in my hand when I turned it on. No instructions on how to use anything. Mold & shower shelf was broken. Dead bird on patio that had been there long enough to become a skeleton. We are so sorry to hear this. We can assure you this has been followed up with housekeeping and changes made. Great property with wonderful views. Happy to spend a wet day indoors. Wonderful location. House was clean and tidy. Upstairs shower needs urgent attention as it doesn't drain away and therefore floods the bathroom. The house really needs wi-if too. All in all a lovely stay though.